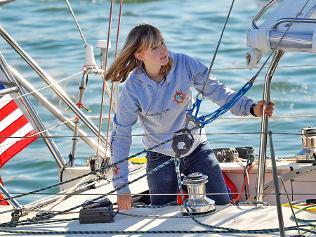 Abigail Sunderland’s attempt to become the youngest person to sail solo across the world ended this week in disaster. The mast on the 16-year-old’s yacht collapsed in rough seas, forcing the evacuation of Sunderland whose ship had sent out a distress signal. Luckily, Sunderland was pulled safely from her damaged ship. However, critics are blasting her parents saying she never should have been cast out to sea alone to fend for herself. Los Angeles Times sports writer T.J. Simers had actually called Sunderland’s around -the-world sailing attempt “child abuse” in a previous column and pretty much picked her for his 2010 Dead Pool. Even before Sunderland’s voyage started, Simers proclaimed that her parents should be “hauled off to jail” for letting their daughter risk her life so foolishly. Simers pointed out that Sunderland’s parents wouldn’t even let her walk alone outside after dark. Yet, they let her sail around the world alone. Sunderland’s voyage was done in by 60 knot winds and 25-foot high waves which crushed her boat’s mast. You are currently browsing the archives for the sailing category.